Product = A product is seen as an item that satisfies what a consumer demands. It is a tangible good or an intangible service. Tangible products are those that have an independent physical existence. Price = The amount a customer pays for the product. Promotion = All of the methods of communication that a marketer may use to provide information to different parties about the product. 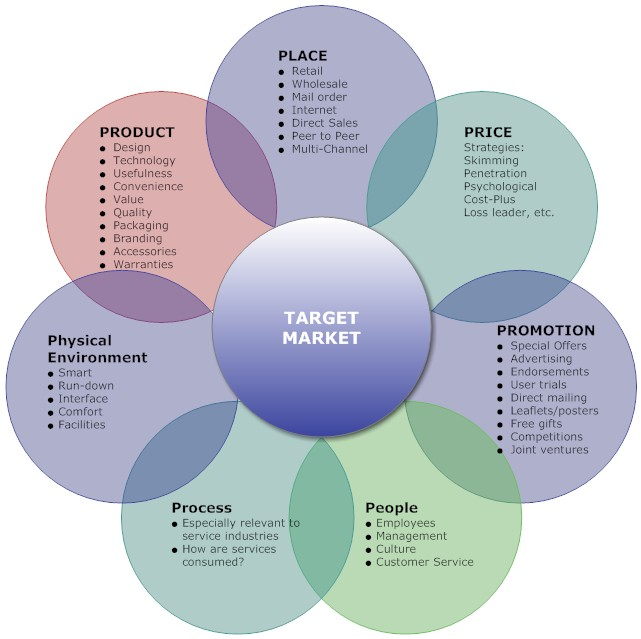 Place = Refers to providing the product at a place which is convenient for consumers to access. Physical Evidence = The environment / evidence which shows that a service was performed, such as the delivery packaging for the item delivered by a delivery service, or a scar left by a surgeon. People = The employees that execute the service, chiefly concerning the manner and skill in which they do so. Process = The processes and systems within the organization that affect the execution of its service, such as job queuing or query handling.